• Lots of organic fertilizer options that are 100% kid and pet safe! • Revolutionary new products such as Love your Lawn, Love your Soil and Mag-i-cal are changing the way that we look at lawn care. These products focus on the biology of your soil and promote an environment in which your lawn will thrive. For 5 generations, Jonathan Green has been dedicated to providing homeowners with the highest quality products for a naturally beautiful lawn. Jonathan Green has created the “New American Lawn” program which focuses on the causes and not the symptoms of your problem lawn. As a result, Jonathan Green products get to the “root” of your problems and keep them from coming back, year after year! The Highest Quality Grass Seed... Jonathan Green is committed to growing superior turf grasses, such as their award winning Black Beauty grass seed! All of their mixes are comprised of the tough, drought and disease resistant grasses that will thrive in our climate. Simply choose the mix that best describes how much sunlight or traffic your lawn receives. Looking for the very best that Jonathan Green makes? Then grab a bag of Black Beauty Ultra - this mix of Tall Fescue and Kentucky Bluegrass thrives in both high sun and heavy shade because of its self-repairing nature and it's ability to grow grass roots up to 4 feet deep! Top Notch Fertilizers (Chemical)... Jonathan Green offers a wide selection of lawn fertilizers designed to feed your lawn during the spring, summer, and fall. Some unique products include their crabgrass preventer that allows you to apply the product up to 3-4 weeks after crabgrass germinates, which is great for when you want to do some patch seeding early in the spring. Also, their Summer Survival lawn food contains a high powered insect control that will zap surface bugs that can cause damage throughout the summer. Jonathan Green's Organic Lawn Foods are Second to None... thanks in part to two revolutionary soil amendments including Love Your Soil and Mag-i-Cal. Love Your Soil is an exclusive product to Jonathan Green's lineup that softens and conditions clay and compacted soils better than soil aeration. Mag-i-Cal is a calcium fertilzer that quickly raises soil pH to levels that your lawn will thrive in so that weeds will not encroach. Use both of these products with your annual fertilzer program to improve the biology of your soil and promote a natural, thick, and healthy turf! Looking or an all natural lawn food that will also help to prevent weeds? Try their corn gluten based fertilizer is a customer favorite that feeds your lawn and helps to prevent weeds. All while being 100% safe for your kids, pets, and the environment. 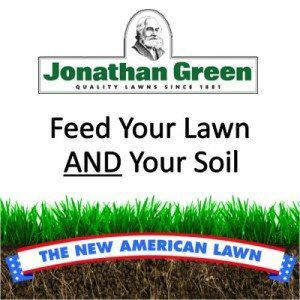 For more information on The New American Lawn from Jonathan Green, click here. 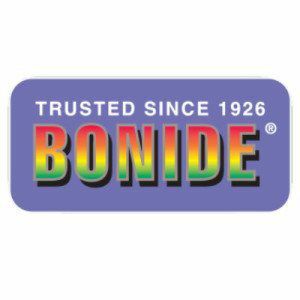 Bonide is a family-owned company that has been producing lawn and garden products for over 90 years now. They are dedicated to providing what the homeowner is looking for to solve their next problem. Their core is the many herbicides, pesticides, and fungicides that they produce, but they also have an assortment animal and rodent repellents, plant supplements, and plant food. Besides for the harsh chemicals that have been around for years, Bonide also has dozens of safer to use products and 100% organic products that you can use to kill, repel, and protect! Bonide herbicides include their popular chickweed/clover killer which is great for all of those tough-to-kill, creeping crawling weeds found in our lawns. They also make the Weed Beater Ultra, which is a proven to kill weeds in cooler weather than the typical weed controls do. It is these types of unique, innovative solutions that are solving the needs of today’s homeowner. Bonide pesticides practically have no end! Whether it is a fast-acting kill on contact bug killer, a systemic insect killer, a smothering oil-based product, or something 100% organic, Bonide has a solution for you. Every product is available in an easy-to-use spray or applicator bottle. However for the heavy user, a concentrate is often available which presents a great value for those large or repeat applications. Bonide fungicides range from ingredients such as chlorothalonil to copper, and neem to sulfur. Depending on the plant and the fungus, Bonide has a product offering for almost any type of lawn or plant disease that you can image. Some of these fungicides are even combination products and may include an insect or mite killer as well. To help diagnose your situation, Bonide has even supplied us with their Expert Problem Solver Diagnostic Center which is loaded up with pictures and descriptions of some of the more common insects and disease that effect plants. This screen is located in our lawn and garden department is a great resource to have. Stop on by to check out this screen that is constantly improving each year! Three other products that deserve mention in this write-up are Bonide’s Repels All animal repellent, Mouse Magic rodent repellent, and their Spider and Ground Bee Killer. Please stop by our Lawn and Garden department and one of our Bonide trained sales clerks will be happy to help you. Model #20339 - FWD recycler mower with SmartStow. Regular price is $359. Save $20 with instant rebate. Your sale price - $339! Model #21383 - RWD super recycler mower. Regular price is $549. Save $50 with instant rebate. Your sale price - $499! Model #21384 - RWD super recycler mower with Electric Start. Regular price is $649. Save $50 with instant rebate. Your sale price - $599! Toro brand lawnmowers and snowblowers are backed by over 100 years of innovation and dependability. We love the Toro brand products and we know you will too! Not only are our sales clerks here to help you choose the right tool for your home, are service department is here to help you if anything were to go wrong. All Toro mowers and snowblowers are backed by a 2 year homeowner warranty but they will last you many more years than that! 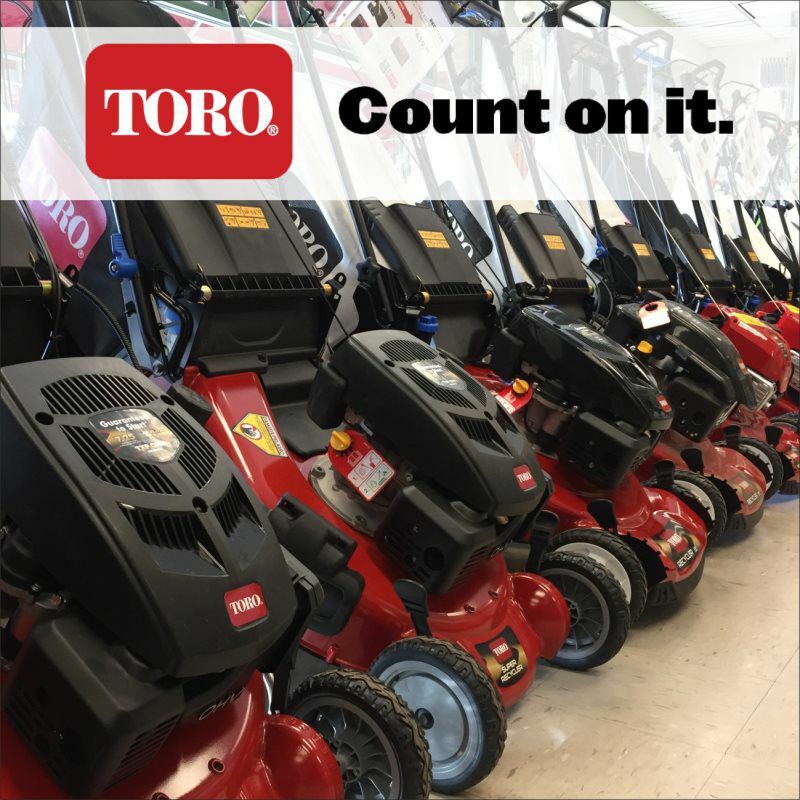 However if you need maintenance or replacement parts our service department is here to help you with getting that Toro back up and running, just like new! We are one of the few sales and service Toro dealers in the area and we always service what we sell. Toro Lawnmowers – Toro makes many different models depending on what you are looking for. They have an economical 20″ hand push mower for those looking for the most simple of mowers. They have their most popular line-up of recycler mowers with larger 22″ decks, adjustable handle and deck heights, 3-in-1 mulch, bag, or side discharge capabilities, and the personal pace drive system (most models). The newest addition to the recycler lineup has been the all wheel drive unit, and we have been getting great feedback on this model. Its added traction and propulsion for uneven or tough to mower areas makes it a great choice for many. Another popular unit is the FWD Smartstow model that quickly folds and flips up on its nose for easy storage! At the top end of the Toro line-up are their super recycler models that have cast aluminum 21″ decks, extended 5-year warranties, Toro OHV engines with autochoke and quick-stow folding handles. There are lots of features to point out that simply cannot be done through this brief write-up, so if you are interested in Toro lawnmowers, please stop by our Lawn and Garden department and one of our sales clerks will be happy to show you all of the features of one of these mean grass-cuttin’ machines! Available year-round, but on display from February through September. Toro Snowblowers – Toro has long been the market leader when it comes to snowblowers, and their single-stage Power Clear Snowthrowers are a favorite amongst our customers. In fact, these are the only type of gasoline snowblowers that we carry! All Power Clear blowers come with powerful OHV Toro brand engines that can throw snow up to 35 feet away. The single-stage action is unique because it acts as a self-propel system as well. This is because the rubbery paddles that scoop the snow make contact with the ground and propel the snowblower through the snow. The scraper in the back of the snowblower lifts the last bit of snow for a clean pathway on the very first path. These units are compact and powerful. Available in 18″ or 21″ clearing width. Features vary depending on the model chosen. Stop by and talk to one of our experts on snowblowers to be sure that you are getting the right one for your needs. Snowblowers are typically on display in November and stay on display until sold-out. This California based company, is family owned and operated and dedicated to making all natural fertilizers and soils that give back to the very Earth from which they are made. 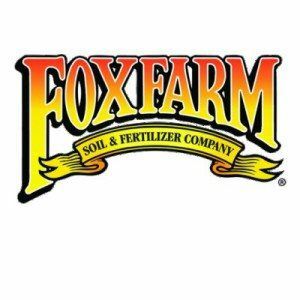 We offer FoxFarm’s soil mixes, soil conditioners, as well as their liquid and dry fertilizers. All of their fertilizers are rich in beneficial micro-nutrients, and are derived from ingredients that your plants will love, including earthworm castings, bat guano, kelp, and fish meal. Also, most every fertilizer or potting soil from FoxFarm is enriched with soil microbes that will help your soil come alive! 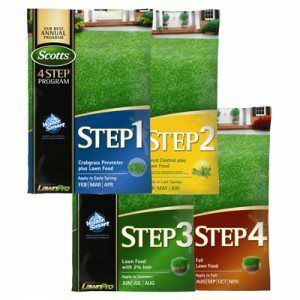 It’s that time of year again, and what better way to get a head start on your lawn than with the Scotts 4-Step Annual Lawn Program! Now on sale through the end of June, you will save 10% when purchasing all 4 bags at the same time. PLUS…receive about 20% back in the form of a rebate from Scotts, which amounts to a savings of more than 30% off the regular price! It is recommended to feed your lawn at least 4 times each year, since the nutrients that are present in the soil continue to be used up as the grass looks to thicken. By using Scotts 4-Step program you give your precisely what it needs at the correct time throughout the spring, summer, and fall. Step 1 is a high nitrogen fertilizer that includes a crabgrass preventer. If you are seeding, be sure to ask for Scotts Step 1 for Seeding (priced slightly higher) as a substitute for Step 1. Step 2 has been improved on and now includes a weed killer that works better without the need to water the lawn before. Step 3 is a summer fertilizer with high iron designed to keep your grass green without excessive growth during periods of little precipitation. Lastly, Step 4 is a fall fertilizer than helps your lawn strengthen before the winter steps in. NO coupons accepted on Scotts lawn programs. Need to seed this spring? Substitute Regular Step 1 for Step 1 for Seeding and pay a little bit more for the program, but increase your rebate. See store for details.